Heat the vols au vent for a few minutes in a warm oven. Fill a large pot with cold water. Cut the pomegranate in quarters. Hold each quarter under water and gently remove the seeds. The seeds will sink to the bottom, the white skin pieces will float to the top, where you can easily scoop them out. In a small mixing bowl, add the Pomegranate Balsamic Condimento to the cream cheese and beat until incorporated. Using a piping bag, fill the shells with the whipped cream cheese or yogurt mixture. 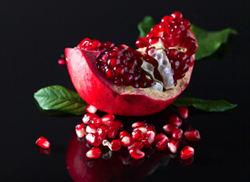 Sprinkle the pomegranate seeds on top of the cream cheese or yogurt mixture and serve.